ACTIVITY 40: You are going to read a magazine article about women in advertisements. For questions 1-5, choose the answer (A, B, C or D) which you think best fits according to the text. Then check the correct answers. 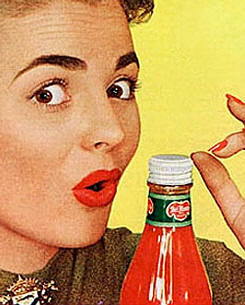 Until recently, women in advertisements wore one of three things – an apron, a glamorous dress or a frown. Although that is now changing, many women still feel angry enough to deface offending advertisements with stickers protesting, "This ad degrades women". Why does this sort of advertising exist? How can advertisers and ad agencies produce, sometimes after months of research, advertising that offends the consumer? The Advertising Standards Authority (the body which deals with complaints about print media) is carrying out research into how women feel about the way they are portrayed in advertisements. Its conclusions are likely to be what the advertising industry already knows: although women are often irritated by the way they are seen in ads, few feel strongly enough to complain. Women are not the only victims of poor and boring stereotypes – in many TV commercials men are seen either as useless, childish oafs who are unable to perform the simplest household tasks, or as inconsiderate boors, permanently on the lookout for an escape to the pub. But it is women who seem to bear the brunt of the industry's apparent inability to put people into an authentic present-day context. Yet according to Emma Bennett, executive creative director of a London advertising agency, women are not infuriated by stereotypes and sexist advertising. "It tends to wash over them; they are not militant or angry – they just find it annoying or tiresome. They reluctantly accept outdated stereotypes, but heave a sigh of relief when an advertisement really gets it right." She says that it is not advertising's use of the housewife role that bothers women, but the way in which it is handled. "Researchers have often asked the wrong questions. The most important thing is the advertisement's tone of voice. Women hate being patronised, flattered or given desperately down-to-earth commonsense advice." In the end, the responsibility for good advertising must be shared between the advertiser, the advertising agency and the consumer. Advertising does not set trends but it reflects them. It is up to the consumer to tell advertisers where they fail, and until people on the receiving end take the business seriously and make their feelings known, the process of change will remain laboriously slow. A. change women's opinions of themselves. B. show any understanding of people's feelings. C. persuade the public to buy certain products. D. meet the needs of the advertising industry. A. condemn the role of the housewife. B. ignore protests about advertisements. C. present a misleading image of women. D. misrepresent the activities of men. A. give further emphasis to practical advice. B. change their style rather than their content. C. use male images instead of female ones. D. pay more compliments to women than before. A. take its job more seriously. B. do more pioneering work. C. take notice of public opinion. D. concentrate on the products advertised.